As a call center manager, you’re probably aware of the special qualifications required to work in this fast-paced and often stressful environment. Trying to find the right candidate to fill a call center agent position can seem like a daunting task for even the most seasoned manager. 3C Contact Services tells their partners that if you know what to look for in candidates, the interview process will go much smoother. Plus, you’ll avoid hiring an agent who may have looked great on paper, but ended up being a poor fit. In order to provide the best level of service to your customers, your agents will need to remember as much information as they can about your company. By the time they start taking calls, they should know all about your products and services as well as your organization’s core philosophy. They should also be aware of their limits and know when to transfer a call to another agent who might be more qualified. Keep in mind that the longer the agents are with your organization, the more knowledge they will acquire and the better they will be able to handle calls. The probationary period can provide you with the opportunity to see your new agent’s knowledge-retention skills. After receiving the same questions day after day, your agents may just start to run on auto pilot and give standard answers. This is a risky situation, since they may not satisfy your clients’ needs. That’s why it is important to make sure that your agents pay close attention to what your customers are looking for—even if they’ve answered the same question 50 times that week. Finding someone with great organizational skills should be at the top of the list when hiring a call center agent. Being able to multitask will cut down on errors, if not eliminate them completely. The candidates you look at should have a proven track record of being organized, as well as have general knowledge of call center software. Over the course of the day, your call center agents will deal with a variety of customers: everyone from angry customers to customers who will want to know every single detail about your product or service. Your agent will have to be flexible enough to treat each customer like they are the first call of the day—that includes not allowing potentially negative calls to damper subsequent calls.Your agents should also be prepared to work flexible hours, including evenings, weekends, and holidays. It goes without saying that working in a call center can be a stressful environment—between heavy call volume and frustrated callers, your agents will have to deal with a lot over the course of one day. That’s why it’s important to find agents who have a calm and cool demeanour so they can handle pressure effectively. 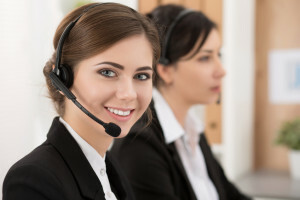 It’s beneficial to hire call center agents who can think on their feet, since they will likely be able to come up with solutions to any issues your customers may have. This will lead to greater customer satisfaction, since they’ll feel that they are receiving customized treatment instead of the one-size-fits-all approach. Call center agents should also be friendly, efficient, and above all else, have effective communication skills. 3C Contact Services provides state-of-the-art contact center solutions that are designed to provide our clients with the greatest level of support in customer service and customer care. Contact 3C Contact Services today if you’d like to learn more about how we can help your company maximize your relationships with your customers.